The new STIHL BR 700 steps things up a notch in the STIHL blower range. This high output professional blower is our most powerful model to date. Able to clear piles of wet leaves, and reduce bottom line costs with its fuel efficient engine, it is the ideal tool to get control over tough landscaping tasks and large property maintenance. Professionals will love the adaptive design features, including an adjustable telescopic tube to accommodate users of different heights, and different applications, as well as the control handle that adjusts easily without tools to provide the most comfortable position. For further convenience, this blower comes with a semi-automatic choke for smooth and easy starts. Designed with an optimal power-to-weight ratio the BR 700 combines power and portability so you can get the job done whenever, wherever. REDUCED-EMISSION ENGINE TECHNOLOGY - CARING FOR NATURE: The STIHL® Inc. "Caring for Nature" seal identifies its powered products that are more environmentally conscious, producing zero or low exhaust emissions. 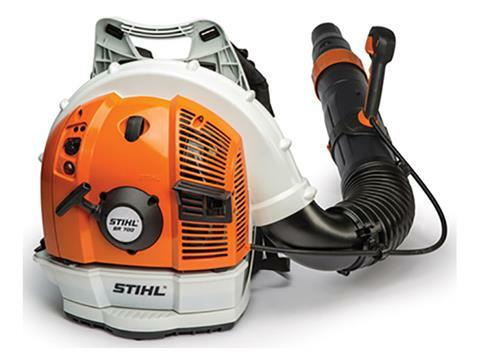 STIHL Inc. defines "low exhaust emissions" as being cleaner than EPA and / or CARB exhaust emission standards. Adjustable Nozzle is great for stairs and operators of different heights. Throttle Trigger Lockstop Switch for ease of operation. Air Filter Cover is easy to remove without tools for fast and easy filter cleaning or replacement. Protected Spark Arrestor Muffler has large baffles which reduce sound level and contains a screen designed to reduce the emission of sparks. Helper Handle for added air direction control and vacuum use. Upright Translucent Fuel Tank allows operator to easily check fuel level before starting work. Upright for easy filling. Long-Life Cylinders give maximum wear life, better cooling and lubrication, and more power output per cubic centimeter of engine displacement. Superior Balance and Design help reduce fatigue and make handling easy. Smooth, Clean Design has no rough edges to snag on clothing or brush. 2-Ring Pistons improve engine efficiency and hold compression longer than 1-ring pistons. Also they transfer heat from the piston to cylinder better, helping engine stay cooler and last longer. Electronic Ignition provides easier starting, smoother running and no periodic maintenance. IntelliCarb™ Compensating Carburetor measures air on clean side of air filter and adjusts metering diaphragm in carburetor. Keeps RPM level even when filter begins to clog. Anti-Vibration System helps reduce operator fatigue. Easy2Start™ System (E) reduces the strength and effort needed to start the engine.Available on select models. ElastoStart™ Handle has a built-in shock absorber for smoother starting. STIHL handheld blowers have many common features. However, all models may not have all the features shown here. Consult your Dealer for details.